CITY HALL (1977-) - 101 CITY HALL PLACE / HOLLOWAY ST.
Am I crazy, or wasn't there a different entry for this building just a week or so ago, which I thought I commented on? you've hit on one of the fundamental problems I've tried to navigate in creating this database, which is/was: if you reduce the built environment - place - to a single unit of measure, what should that unit be? In telling the story of that place, do you limit the story to the unit, or tell the story of the place? Endangered Durham solved this problem rather well, because there was no consistent unit of measure. So each narrative could tell the story of place in a unique way. But that doesn't work well as an organizational system, or a database, because how do you describe a unit? My path through this, in converting Endangered Durham to Open Durham, was to use the building as the unit of measure. But to tell the narrative story, in the full description, of place - buildings before and after, expansion and contraction, etc. So that is the theory and practice behind what you encountered. You commented on a post about one of the preceding buildings at this geographic location which, in the full description, told the story of the subsequent fate of the place. This post should also tell the story of the buildings that preceded city hall, but I didn't have time, in subdividing all of the old posts, to make every one complete. 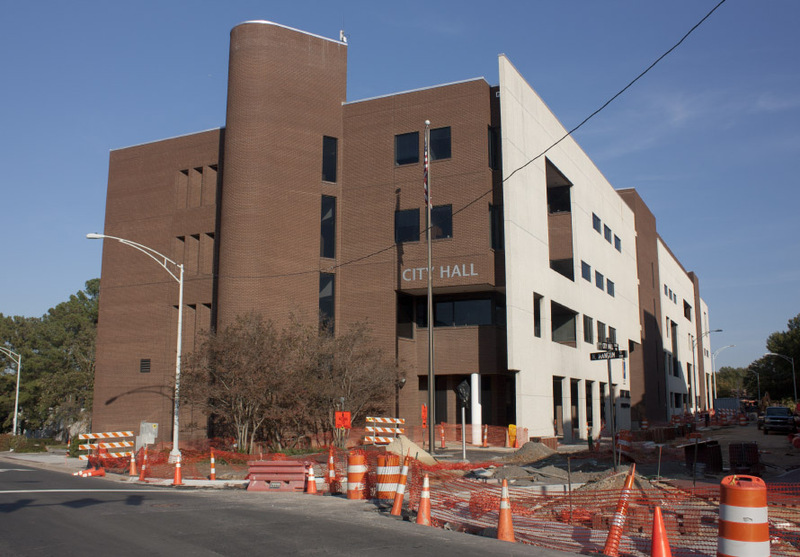 When it was completed, later-mayor Charlie Markham called the 1970s-era Durham City Hall building "utterly depressing - a pollutant to the visual environment of Durham." Before this "pollutant" stood on the site, several commercial structures, an old apartment building, and the Planters' Warehouse stood on the site. 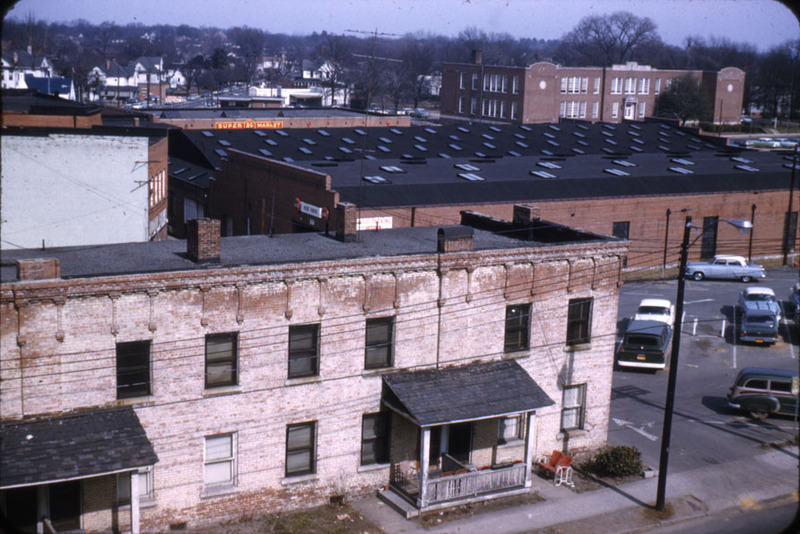 Bittman Apts, with the Planters Warehouse and Fuller school in the background - looking northeast from the 100 block of Holloway, 1963? 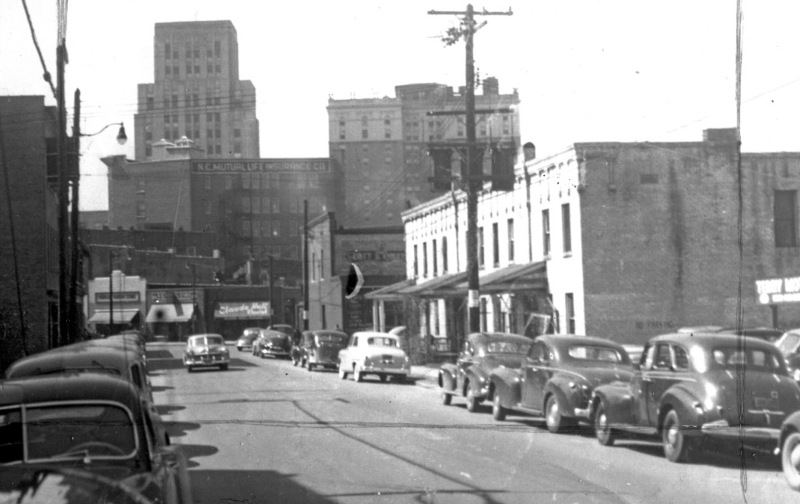 Looking northeast from North Mangum and Holloway St., 1963? The east side of the 300 block of North Mangum St. and the north side of the 100 block of Holloway St. developed as a residential area during the late 1800s, which was supplanted by commercial buildings and apartments during the late 1910s / early 1920s. The Bittman Apartments, with its unique brickwork at the cornice must have been built by the same contractor who built 302 North Mangum, the building at the corner of North Mangum St. and Holloway St. This area was slated for redevelopment per the grand vision of the Tarrant plan, which envisioned a giant government complex on this site, with green space stretching westward. These ideas were picked up by the Durham Civic-Convention Center Commission, the Downtown Revitalization Foundation, and the Bell Design Group, which endorsed a new City Hall, a new Courthouse, and a new convention center to be built at Roney, Chapel Hill and Foster Sts. George Watts Carr's firm, with Frank DePasquale as the project architect, took the lead in designing a new police department, a new fire station, and a new city hall. Demolition and construction of the Fire Station and Police Department got underway; the funding for a new city wasn't present, and thus the buildings most directly in its way held on briefly after the Planter's warehouse and northern portion of the block were demolished. 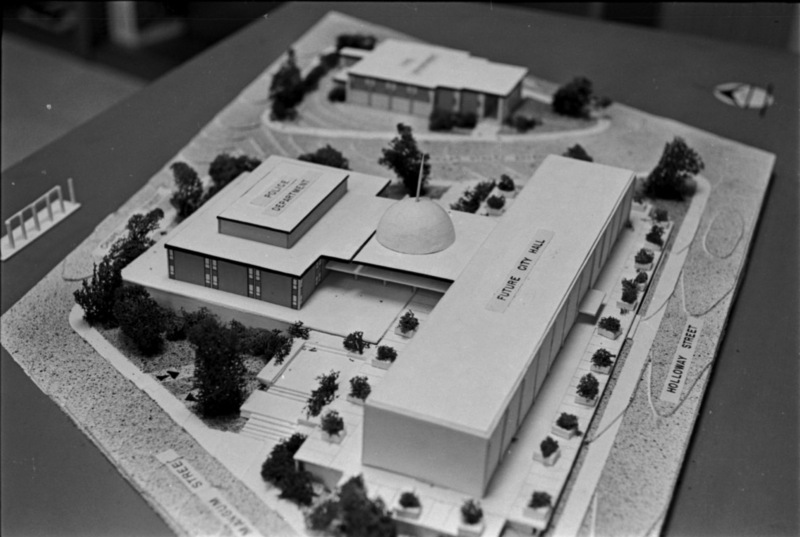 In 1964, they were demolished as well. 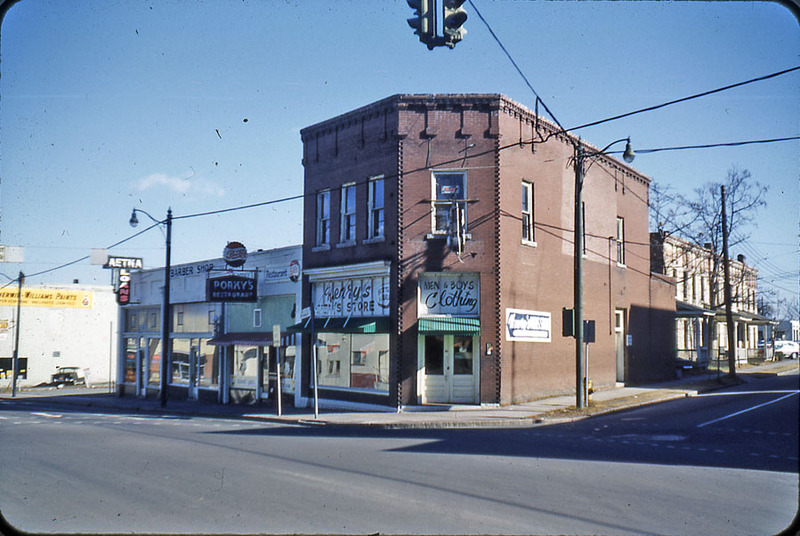 Looking northeast at the corner of Holloway and North Mangum, 1965. For about 10 years, this land remained solely surface parking. However, through a Federal revenue sharing program (that I don't completely understand) Durham somehow managed to "get $25.4 million value out of an $11 million gift." This financed all of these buildings, and a slew of other infrastructure projects. DePasquale's design, with it's grand entrance off Mangum to a glass-domed council chamber, was tossed in favor of John Latimer's firm, with politically-connected project architect John L. Atkins, III as lead. The city hall was begun in 1975. And was completed by 1978. The postmodern design obliterated the connection between city hall and the other two government center buildings, making the pedestrian access inscrutable, and obscuring the neoclassically-inspired facade of the police station, which soon ceased to be a police station and became "City Hall Annex." The old city hall on Morris St. was decommissioned, and became the home of the arts council. This remains the main city hall building. And man, it is a tough building to try to appreciate. I do give them points for trying to make it interesting. But the strange facade, the metal railings, the tower, the round thing on the side that I assume was a parking exit - it's an odd silliness paired with an intensely imposing building. Frankly, looking at the pictures above, I can find some appreciation for the design. But the experience of walking by it is a completely different story. Ugh. People have accused me of being anti-modern, or even anti-post modern (which is what I would call this.) I'm really not; but it seems that modernism and post-modernism have a greater capacity for sheer ugly to me than classical forms. Perhaps the greater freedom to design anything without rules can allow you to reach both great heights and dark depths of design. I'm always cautious about wishing for a building's demise - am I making the same judgment that my predecessors did 50 years ago about the buildings I think were beautiful? It's hard to imagine with City Hall, simply because, whimsy aside, it is so out of scale to the area. Perhaps on a street full of skyscrapers it would be interesting (and, to be fair, I know that's how they envisioned the future Durham in the early 70s - all LeCorbusier.) Here, it's monstrously outsized and awkward. Durham appears to be attempting to de-uglify city hall circa 2015. I think they picked the wrong shade of lipstick for this pig.